There’s just as much sound, bay and estuary water as there is ocean beach on the OBX, making for a maze of salt marsh and open shallows that beckon paddlers. 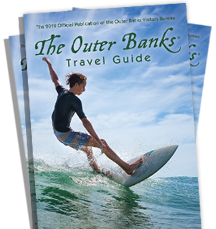 There are guided tours, specialty shops and outfitters, and plenty of public water access for kayaks and canoes on both sides of the barrier islands. Ride Atlantic Ocean waves or slip into serenity on the Pamlico or Roanoke Sounds.